Since my last few posts have focused on buttons, let's continue the trend for at least one more. I say "at least" because you know I can't stay away from the buttons for long. As well, several of you have asked for examples on how I use buttons and I might just share some with you in the coming days. 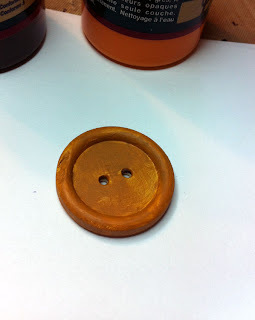 For now, I did play with my wooden buttons some yesterday. I wanted to go with a warm autumn theme and tried for a nice orange. Instead. . .I got this. Is that not the nastiest shade of orange you've ever seen? Back to the drawing board on that one I guess. . . I hate to shift from the grossness of that color to food, but it is time for my meal plan. It's not the most extensive in the dinner department because we both have some evening obligations this week. But, I did throw in some new (to us) recipes! 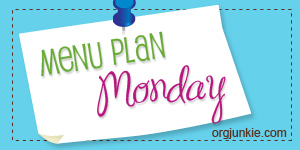 There's more Menu Plan Monday over at I'm an Organizing Junkie. I've got three more items in the ON SALE section of the shop, including these pretty Lucite earrings. 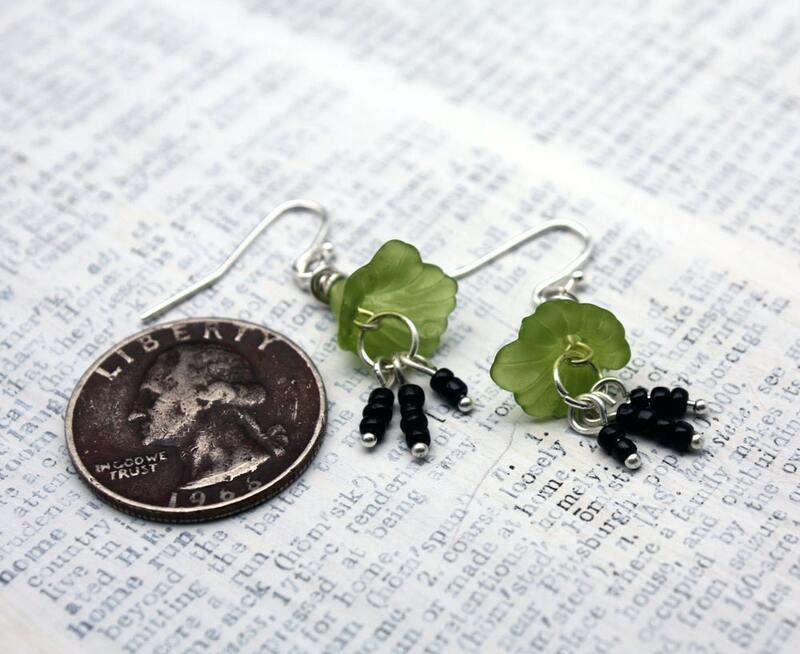 You'll recognize these next earrings from my Bead Soup. I finally got them listed! I'm off to figure out if I can save the ugly orange button with some other layers of paint. I've got my fingers crossed! I love the name "Steampunk Circus"! Cute earrings! 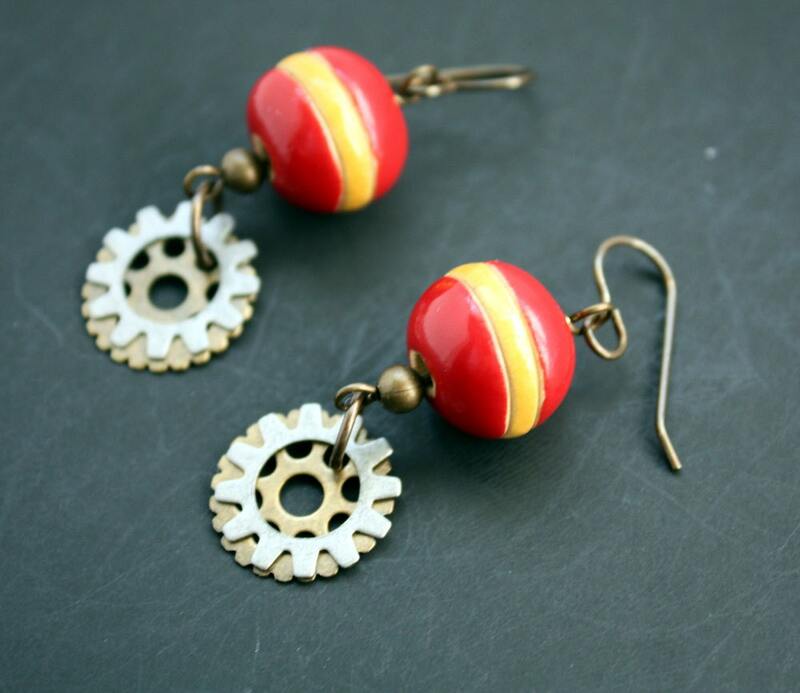 I love the Steampunk Circus earrings too! So colorful, and I love how the gears create movement just like in a real circus! I'm anxious to see how you transform that button. It's really not all that ugly, it just need a little makeup. I don't think your button is all that ugly, try sponging a soft yellow on to the orange, it will lighten up the orange a little! Pretty earrings, I love the name "Steampunk Circus"!!! Hi Hope, All is not lost with the ugly orange just like you said add a different color. They are going to be shabby right? Yummy the menu for this week sounds delicious. It was love at first sight on the little Twirling Fairy Skirt earrings so I'm giving them a new home where they will be well taken care of. Thanks for creating such little lovelies. My husband and I love grits...especially with butter, salt and pepper! Yum! Your potato dish looks too cute! I love it! Thanks for sharing your menu! I'm the lover of grits around our house. The hubs would much rather just have cold cereal or oatmeal. My grits need lots of butter, salt, and pepper as well as a healthy dose of CHEESE and a sprinkle of garlic. YUM! !